There’s something cool to do at Beakerhead every day no matter what your budget is. Beakerhead’s 2018 festival runs from September 19 to 23. A scene from Beakernight 2017. Photograph by Trevor Lalonde. Beakerhead is a year-round initiative that aims to unite people at the intersection of art, science and engineering. This month, its main festival returns with more than 60 events around the city from September 19 to 23. Events range in price from free to $100, so we’ve selected some choice options for each day of the festival and divided them up into free, budget (under $40) and splurge ($40 and up) categories. 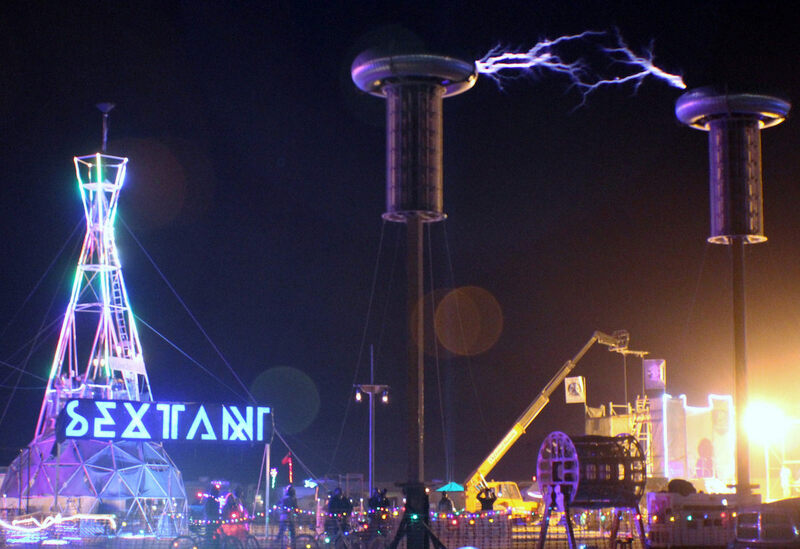 The Sextant Tesla Coil will be on display at Fort Calgary throughout Beakerhead. 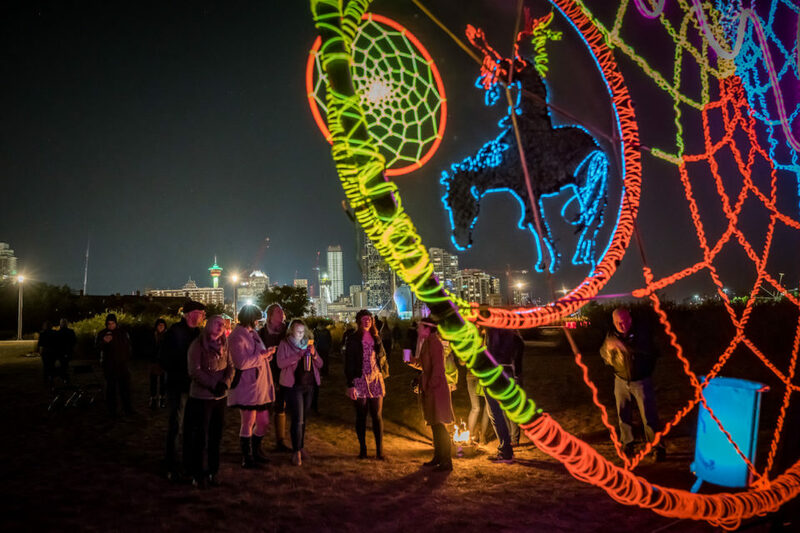 ​Get familiar with the world of Beakerhead by jumping headfirst into its hub at Fort Calgary, where a collection of massive installations known as “beacons” awaits you. Built by an international team of multi-disciplinary visionaries, Pulse and Bloom is a 12-foot tall lotus that lights up in sync with heartbeats upon touch. You can also interact with the controls for the Sextant Tesla Coil, which shoots 18 feet of electricity between two 32-foot towers. Finally, learn about “living architecture” on a stroll through the Garden Party on your way to your way next destination. Where: Fort Calgary, 750 9 Ave. S.E. On the other end of the core in Sunalta, QuickDraw Animation Society is hosting the Animation Atelier, where all are welcome to come and learn some of the basics of animation. Each participant’s work will be woven together for a project that will screen at Beakernight on Saturday, September 22. Pre-register for $18 to ensure your spot. Where: QuickDraw Animation Society, 2011 10 Ave. S.W. When: 6:30 p.m. to 9:30 p.m.
Over on 4th Street in Mission, Neal’s Yard Remedies wants to teach you about skincare at the Build Your Own Organic Facial Oil event. Not just what’s good for your specific skin type, but which ingredients to avoid if you want to lighten your environmental footprint too. $68 covers the cost of materials and instruction, and nets you a bottle of custom facial oil to take home. Where: Neal’s Yard Remedies, 130, 2207 4 St. S.W. 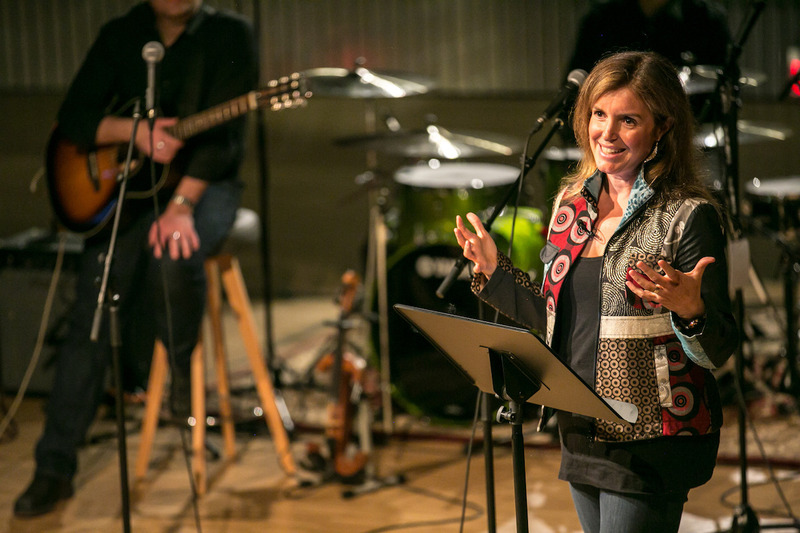 Seven Wonderers blends fascinating storytellers with live music. Have You Ever Wondered… An Evening with Joe Schwarcz features the titular popular science personality giving one of his illuminating talks at Mount Royal University’s Ross Glen Hall. Not only is the talk free (with registration), but you can also participate in an interactive pre-show “pop-up science carnival” from 5 p.m. to 7 p.m.
Where: Glen Ross Hall, Mount Royal University, 4825 Mount Royal Gate S.W. When: 7 p.m. to 8 p.m. In addition to being a key ingredient in the multi-restaurant Beakereats series, canola also comes to the fore at the How to Make a Vegan Canola Carrot Cake event at Cookbook Co. Cooks. Brush up on your baking skills and take home a cake smothered in macadamia nut icing for $32.50. Where: Cookbook Co. Cooks, 722 11 Ave. S.W. When: 6 p.m. to 8 p.m. Seven Wonderers is a signature Beakerhead event returning due to popular demand. Inside Studio Bell, scientists, artists and other interesting characters take the stage to share stories set to live set music. Beakerhead selects only the best and brightest to participate, and this year there’s a secret twist to the proceedings. Scoop up an advance ticket for $45. Where: Studio Bell, 300, 850 4 St. S.E. When: 7:30 p.m. to 9 p.m. 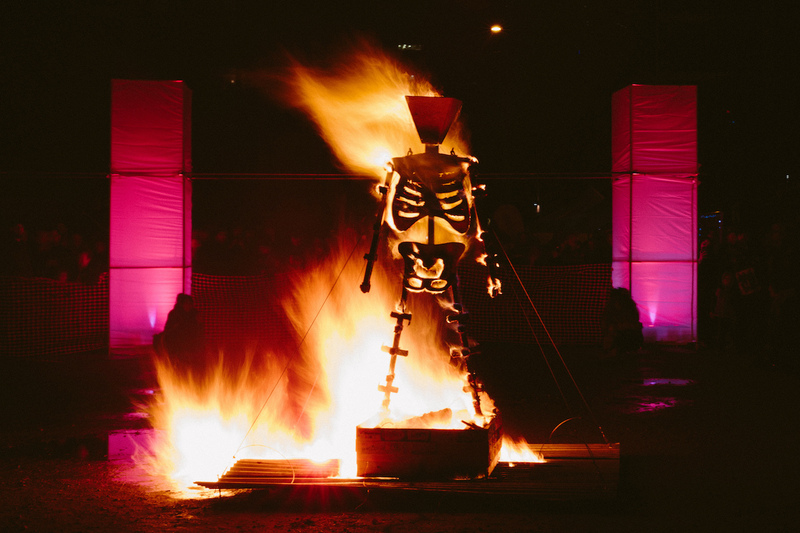 The burning of a wooden effigy is tradition at A Taste of that Thing in the Desert. Inspired by the notoriously offbeat Burning Man gathering held each year in Nevada, A Taste of That Thing in the Desert is a free street party with a multitude of family-friendly festivities. Interactive art, DJs, dancing and more await. Attendees are encouraged to bring their more extroverted attire and stick around for the 9 p.m. burning of a wooden effigy. Where: 311 8 St. S.W. When: 6 p.m. to 11 p.m.
Join members of the Royal Astronomical Society of Canada and experts from the University of Calgary for a guided tour of the galaxy. Car Ride to Cosmos takes place at the Rothney Astronomical Observatory, located about 40 minutes outside of the city. High powered telescopes are supplied to catch a glimpse of heavenly bodies such as Mars and Saturn. The event runs $30 per car load so bring the kids or a group of friends to max out the value. When: 7:30 p.m. to 10:30 p.m. The Central Library transforms into a six-floor escape room complex for one night only during The Locked Library. While the standard ticket price for this event is $40, you can add on a $60 donation (with tax receipt) with proceeds supporting Calgary’s public library system. Hack the Flyer is the steampunk older brother of soap box derbies. While the annual Hack the Flyer event is technically a part of Beakernight, it is held on the East Village RiverWalk outside the ticketed grounds. That means you can bear witness to the madness of hacked wagon racing with or without paying cover. 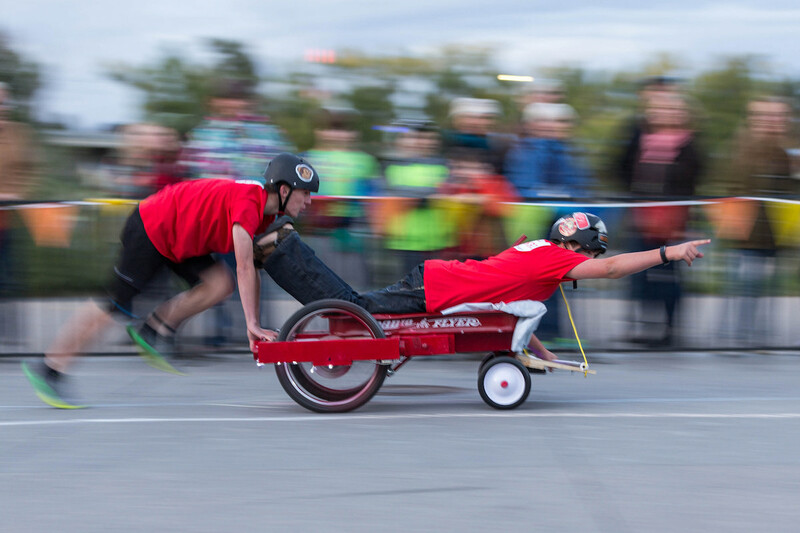 Get a dose of adrenaline watching these DIY-hacked wagons speed around next to the Bow River. Where: East Village RiverWalk, 618 Confluence Way S.E. The pinnacle of Beakerhead each year is the carnivalesque Beakernight. Held this year along the East Village RiverWalk and at Fort Calgary, this event includes the aforementioned beacons as well as music by BassBus, a make-your-own-fascinator set-up and plenty of surprises. Tickets are $8 in advance or $10 at the door, and an after party is being held at The Palace Theatre with UK electronic duo Delta Heavy in performance. The after party is free before 11 p.m. with advance RSVP or paid cover TBD on the night of show. Where: Fort Calgary, 750 9 Ave. S.E. ; East Village RiverWalk, 618 Confluence Way S.E. ;’ After party at The Palace Theatre, 219 8 Ave. S.W. Spend an afternoon at the University of Calgary with paleontologist Annie Quinney and visual artist Jennifer Park. The first part of the event dubbed Move Over, Jurassic Park consists of poring over amber in search of fossils. Then, reverse the process and create your own small fossilized keepsake to bring home. Register in advance for $75. Where: EEL Building, University of Calgary, 145 and 147, 3115 32 Ave. N.W. When: 1 p.m. to 4:30 p.m.
You won’t want to go home without a souvenir from Beakermarket. No one will fault you for being unfamiliar with the Ghost Army, the Allied group of trickster soldiers from WWII. After all, their existence was classified for more than 40 years following the war. Artist Sarah Beck brings elements of their story to the fore with Öde, mixing military and advertising aesthetics to inspire questions on how we see security. This exhibit is displayed outdoors on the museum’s grounds. Stroll through for free, and feel free to check admission rates if you’d like to see more of what the museums have to offer. Where: The Military Museums, 4520 Crowchild Tr. S.W. When: Öde is on now until September 23. The museum’s hours are 11 a.m. to 5 p.m. daily. 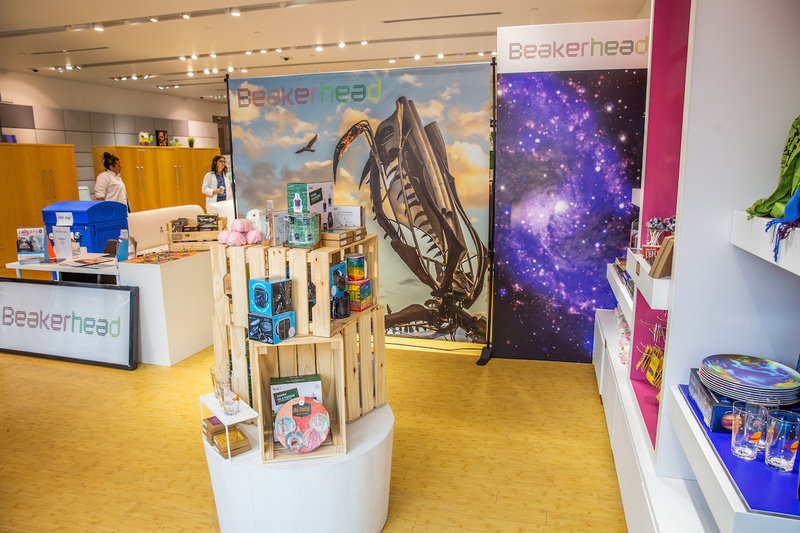 It’s the last day of Beakerhead and you’re dying for a souvenir. Fear not, as the Beakermarket is open on Sunday both at their offices and as a pop-up at Fort Calgary. Where: Beakerhead office, 1405 4 St. S.W. and Fort Calgary, 750 9 Ave. S.E. The McHugh House hosts a workshop with ecologist Emil Ruff and master painter Doro Buch where participants learn a little about microorganisms before interpreting them for the canvas. Small Things, Big Paintings challenges you to get your left and right brain working together and offers a memento in the form your new painting. $65 covers instruction and materials. Where: The McHugh House, 1515 Centre St. S.